A document created by Dane Kolb as part of the Oviedo History Harvest in 2015. 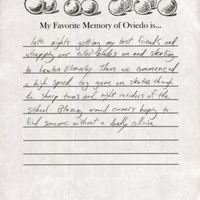 In the document, the author is asked to describe his favorite memory of Oviedo, Florida. Kolb, who was 25 at the time, stated that skating and rollerblading around Lawton Elementary School was his favorite memory. Original document by Dane Kolb, April 18, 2015: Oviedo Historical Society, Oviedo, Florida. Digital reproduction of original document by Dane Kolb, April 18, 2015. Oviedo Historical Society, Oviedo, Florida. Oviedo Historical Society Collection, Oviedo Collection, Seminole County Collection, RICHES of Central Florida. Originally created by Dane Kolb and owned by Desta Horner. Donated to Oviedo Historical Society in 2015. Copyright to this resource is held by the Oviedo Historical Society and is provided here by RICHES of Central Florida for educational purposes only. "RICHES Podcast Documentaries, Episode 41: Oviedo, with Dr. Richard Adicks." RICHES of Central Florida. http://riches.cah.ucf.edu/audio/Ep41-Oviedo.mp3. Adicks, Richard, and Donna M. Neely. Oviedo, Biography of a Town. S.l: s.n. ], 1979. Robison, Jim. Around Oviedo. 2012. "History." City of Oviedo, Florida. http://www.cityofoviedo.net/node/68. Kolb, Dane. 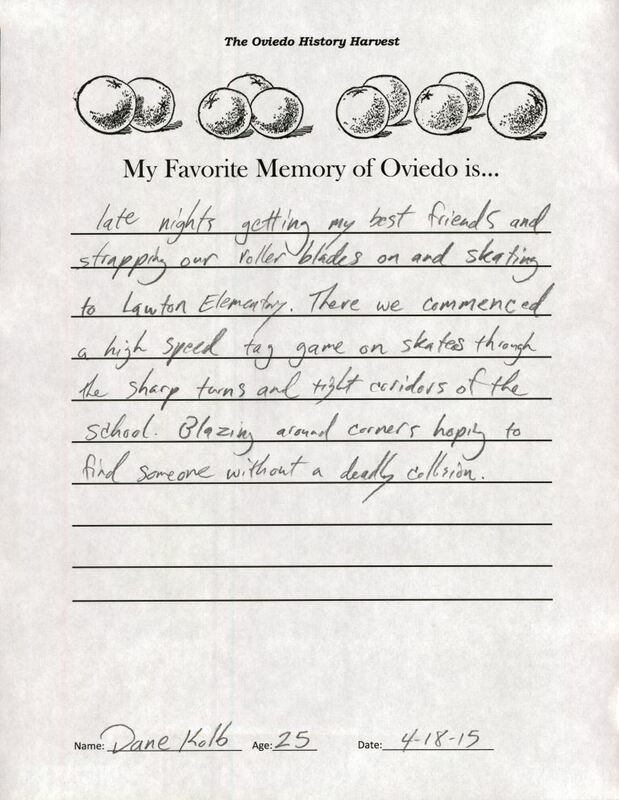 “"My Favorite Memory of Oviedo Is..." by Dane Kolb.” RICHES of Central Florida accessed April 25, 2019, https://richesmi.cah.ucf.edu/omeka/items/show/6342.